January started out with a 29.29 5k and a marathon PR (5:14) in Arizona. I wanted to run 2 marathons to earn the Desert Double Down, mission accomplished! In February I ran the Hypothermic Half and found a yeti. I felt good in this race running 2:23 probably because it was cold. It was my best Half time of the year. 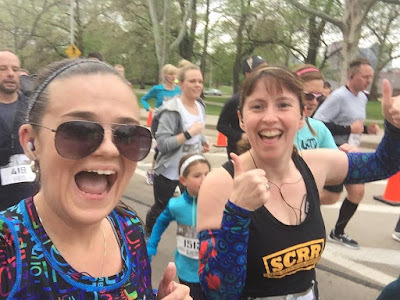 I trained really hard for the Pittsburgh Marathon in May (Sixburgh!) 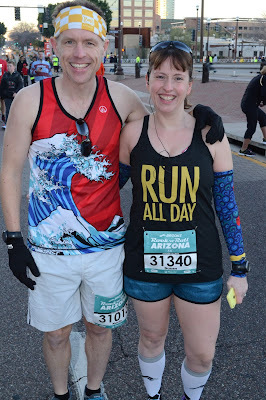 The 5k was brilliant with Brandi. But the marathon didn't go well in terms of time. Instead I turned to beer. I got to hang out with some of my favourite people though. The trip was perfect, exactly what I needed. 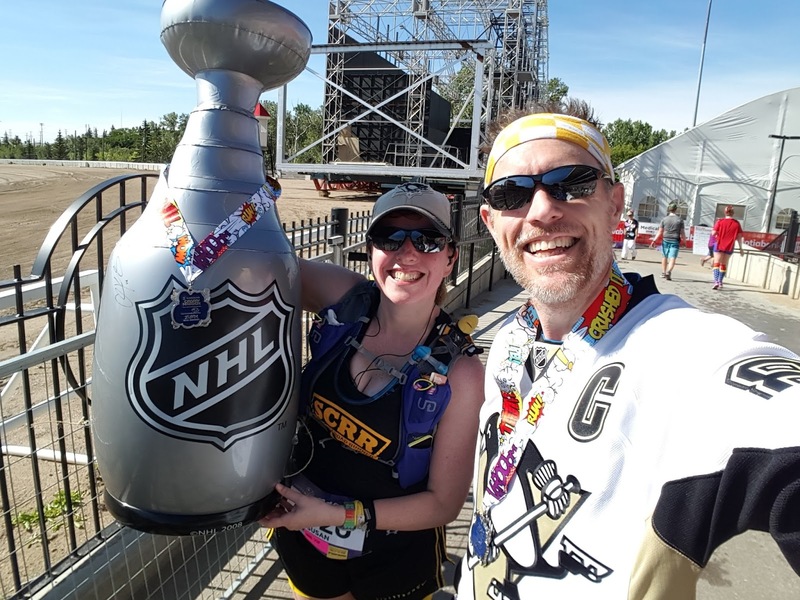 We saw a couple of Pens playoffs when we were in Pgh and by the time the Calgary Half came around we were about to head into the Finals. So this happened. I think it brought us good karma. June was busy with Rock n Roll San Diego (an outstanding race weekend) then Seattle where I ran my 7th marathon (Kev's 8th). 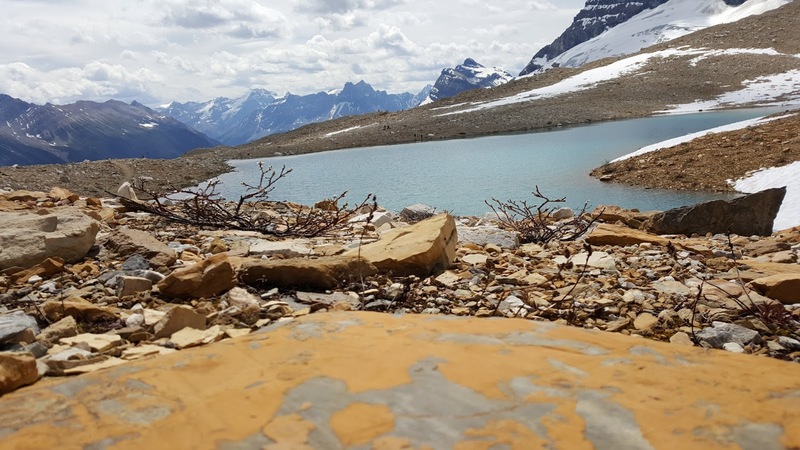 We spent the summer days on long trails in the mountains, covering around 20 miles per trip. It was helluva beautiful. There were 2 trails I've had on the hiking list for years and we finally did them thanks to trail running - Iceline/Whaleback and Lake O'Hara Alpine Circuit. 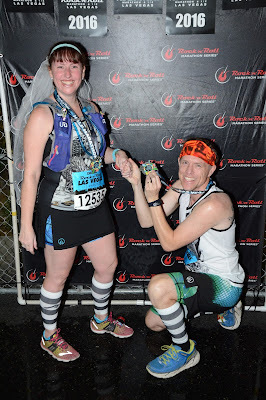 August brought our third visit to the ET Full Moon Midnight race, we chose the 51k again this year. Third ultra complete. In September I got around 54 kms of the Lost Soul 100k. Also, my first DNF but it was well earned I guess. I really need to try this race again. October was all about Rock n Roll Vancouver, a fabulous 10k and the Half. I ran Harvest as a warm up but I was definitely not in great running shape at this point. Nope! Sometimes it's all about fun. 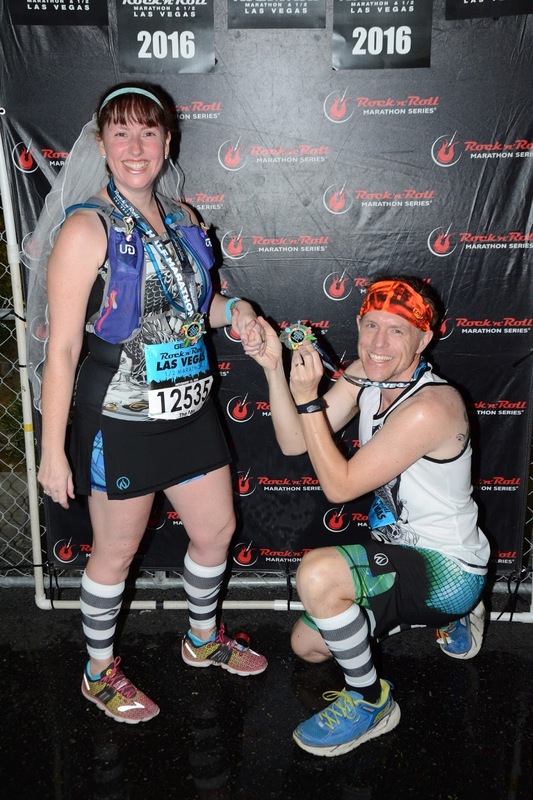 We closed out the year in style renewing our vows at the Rock n Roll Las Vegas run through wedding. Best race experience: Rock n Roll San Diego for the party and the people. Did I mention the Gavin DeGraw concert after the race with free beer? Best running advice you've received this year: DNF doesn't mean failure. Most inspirational runner: Desi Linden. Strong and determined, damn she worked HARD in Rio and she owned every part of her race. Favourite picture: That Vegas one up there, we funny. Race experience you would repeat in a heartbeat: While I was sitting in the finisher tent I had already decided to run Pittsburgh again in 2017. If you could sum up your year in a couple of words what would they be? Epic, varied, challenging. HAPPY NEW YEAR - BRING ON 2017!! You had a great and busy year of running! I may do less next year! :) Thanks Leigh! It took me a little while to see it that way, I have to be honest - but yes, priorities! Loved the best advice you got.